Cnidaria is a phylum containing about 11,000 species of very simple invertebrate animals. They are found exclusively in aquatic environments. The phylum includes corals, jellyfish, sea wasps, sea anemones, and tiny freshwater hydra. They carry stinging organelles and have a basic body shape that consists of a sac with a gastrovascular cavity. Coral polyps take up molecular oxygen. This molecular oxygen is dissolved in seawater directly by diffusion through their tissues. The oxygen can move from the surrounding environment into the epidermal layers of the coral polyp or from the internal gastrovascular cavity into the internal tissues. Within the gastrovascular cavity, there are water pumping cells. These cells in the cavity help the diffusion process. Unlike a sponge, there are no pores. Instead of pores, they have a single multi-functional opening that lets in water when opened and keeps water out when closed. Jellyfish are found in every ocean, from the surface to the very bottom of the deep sea. They are extremely common. Jellyfish do not need to breathe. They have no respiratory or circulatory system. Instead, they absorb oxygen through their thin layer of skin using the process of diffusion. The oxygen gets absorbed through the surface of their outer body. They release carbon dioxide through their skin as well. Jellyfish use their internal cavity called the coelenteron to absorb the oxygen. Box jellyfish are known for the extremely potent venom and are among the most venomous creatures in the world. 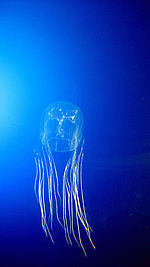 Box Jellyfish are also known as sea wasps. They have no gills or organs to breathe with. They respire through the entire surface of their bodies. Their cells are able to absorb oxygen and release carbon dioxide. Even after death, they are able to continue to release venom from their stingers if the tentacles remain moist.